My son has been taking a keen interest in cooking lately. Since cooking was included in his school syllabus his confidence in the kitchen has increased immensely. One day I came out to the kitchen to see him popping a chocolate coconut slice in the oven, having worked through the whole thing without me realising he was even doing it! The bonus of course was that it came out beautifully and he had achieved such great results without any input from me! I have been a little impatient with him in his cooking efforts before now, despite the fact I have years of experience he always seemed to want to reinvent the wheel and not take advice on what was the best way to do things! He also used to lose interest half way through a recipe and leave me to pick up the pieces, when I usually wasn't in the mood!!!! The last time he made today's recipe we had a long drawn out argument over how it should look as it wasn't working the way the recipe said it should. He abandoned it and I frustratingly tried to recover what I could from his efforts! When he asked if he could try it again, I was happy to let him knowing how much more capable he has become in the last little while. The recipe in question is Microwave Russian Fudge which is from Jo Seagar's "Lip Smackin' Fast Cookin' Hunger Bustin' Gr8 Tastin' Cookbook"-a book designed for beginner cooks, which my son uses frequently and also made his chocolate coconut slice from. I use Jo Seagar's recipes alot, especially for baking. I think I have about 4 of her books which get good use. She has great ideas for gifty type goodies like cookies, fudges, chocolates and I find myself relying heavily on her ideas at Christmas! This recipe in particular is great for kids as it relies on the microwave so it is very difficult to burn the fudge. I have thrown countless pots of Russian Fudge out as it has caught on the bottom and then ruined the whole batch, but this recipe handily avoids that! 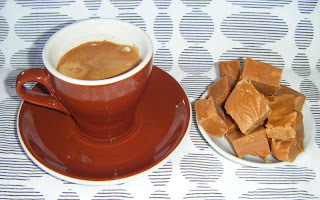 I am quietly very chuffed that Rex has mastered this recipe, as it means he'll now willingly whip it up again, and I adore Russian Fudge!!!! Spray a 20cm square cake tin with non stick baking spray (I also line it with baking paper!). 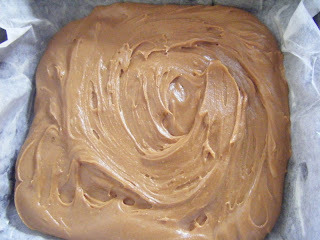 You will need a large pyrex jug or microwave proof bowl as the fudge reaches high temperatures. Place all ingredients, except vanilla, in the bowl and microwave on high for 1 minute. Stir, then cook for 2 minutes, then stir again. Repeat this for a total of 10 minutes. (if you have a sugar thermometer it should read 120C). To test without a thermometer, fill a glass with cold water. The mixture is ready when the drips form into soft balls in the cold water, the mixture should also look a darker more caramel colour. Remove carefully from the microwave and place the bowl on a wooden board to protect the bench. Add the vanilla. 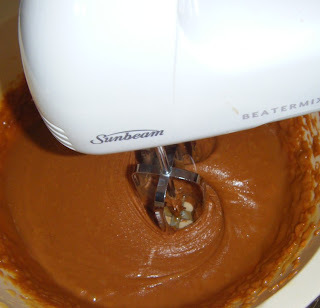 Beat the fudge for 4 minutes with a wooden spoon or electric beater. The mixture loses its shine and starts to become very thick and set. Quickly pour into prepared tin. When cool, mark into squares, then allow to set and cool completely in the tin. There is no better way to enjoy this intensely sweet treat than with a cup of coffee. They work together beautifully!!!!! 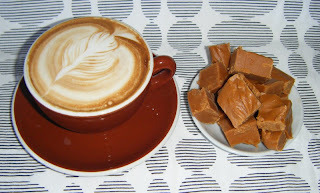 Oh, the coffee and fudge look so good! Your son did a wonderful job making that fudge. Good for him. I'll have to try the recipe. Drool! That fudge looks sooo good. I could eat a TON of fudge, given the chance...I hardly ever make it though, since Tim has diabetes - not so practical LOL. Jo Seager has definitely got some good sweetie recipes! Oh, I love fudge but have never dared trying before. This mivrowave version sounds doable even for me :) Thanks for recipe! Your ravioli sounds great too, but I´ll try to pretend that I haven´t seen it...oh, I´m dying for little pasta! Oooh I love fudge and that looks fantastic. I'd love to try the recipe but without a microwave I'll have to tweak it a bit. thanks for your comments everyone, so cool to see your flags coming up on that little world map, I love seeing that!!!!!! That fudge looks stick your finger in it divine! I just found your blog thru Tastespotting! Coffee and Fudge brought me right to you!